Happy January! Sorry for the delay in putting up a review. I have been reading, but I’ve also been busy with some other news, as you may have seen from last week’s post. If you missed it, my debut book will be published in 2021! In any case, today’s review is for Katie Alender’s MARIE ANTOINETTE, SERIAL KILLER, which I picked up at the Scholastic Warehouse Sale. One of the reasons I love the warehouse sale is that I find books that have been out a while to feature and hopefully bring back to readers’ attention. It also gives me the opportunity to find new authors I sometimes miss. Here’s the cover and description for MARIE ANTOINETTE, SERIAL KILLER. And here are the five things I loved most. 1. The setting – It’s in France! Um, how many books have I reviewed on this blog that are set in France? I don’t even know. Probably enough to make it a category :). In any case, I love that they visit Versailles and the catacombs (I’d rather do that one in a book) and the Eiffel Tower. I’m just biding my time vicariously until I can return for real. 3. The ghost – And for this book, the author said, but what if Marie Antoinette came back as a ghost and started killing people? I don’t think I’m giving anything away here. It’s in the title, people. I’m just not going to tell you why because that’s the mystery you have to unravel as you read. 4. Colette’s character arc – There’s a moment at the beginning of the book where Colette’s brother does something nice for her and she basically says she’ll owe him. He says, “You don’t do nice things for people because you want to get something from them. You just do nice things to be nice.” She doesn’t understand this concept at all, and it’s a very important lesson for her to learn, not only as a person but for her final confrontation with the queen. 5. The relationships – I loved how this book was very much about friendship and how it should look and how Colette’s view of it changes as she grows. But I didn’t just label this point “friendships” because her other relationships change as a result too. 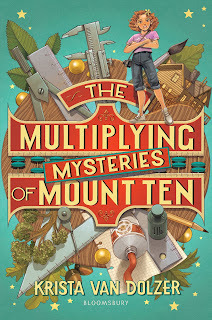 This book was a fun murder mystery sort of book on the one hand, but there was real character development happening that edged it into a read I will come back to again. Have you read MARIE ANTOINETTE, SERIAL KILLER? What did you think? Previous postMy Debut Book, YOUR LIFE HAS BEEN DELAYED, Is Coming in 2021! Great title, great premise. Thanks for telling me about this one. I will put it on my TBR list. My debut book, YOUR LIFE HAS BEEN DELAYED, is forthcoming from Bloomsbury in winter 2021. My fiction is represented by Elizabeth Bewley at Sterling Lord Literistic, and I also do some freelance PR writing and editing on the side. I'm a wife, mom and Christian who loves to play the violin, cross-stitch, cheer on the St. Louis Cardinals and, of course, read. I also watch way too much TV.